From the Hancock County Courthouse, go east on Hwy 16 for 4.7 miles. Turn left on the road to the Culverton Baptist Church. Go 0.5 mile to an intersection with stop sign. Go straight across intersection to dirt road (Fulsome Creek Rd) and go for 1.4 miles to a field road on the left. Turn onto the field road and go 0.4 mile. 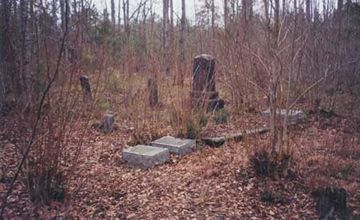 The cemetery is about 50 feet off the road on the right. To live in hearts we leave behind is not to die. Born in Nottoway Co. Va. Died in Hancock Co. Ga. On headstone with Willie Ida Coleman. Life was all the sweeter that she lived and all she loved more sacred for her sake. In tender and loving memory of our dear mother. On headstone with W.N. Coleman. He looked for a city/Which had foundations/ Whose builder and maker is God. It is the Lord; let Him do what seemeth Him good. [sic] w/o J.H. Middlebrooks. Asleep in Jesus! peaceful rest/ Whose waking is supremely blest. Mother of J. Hawley Middlebrooks. No dates given. Her words were kindness, Her deeds were love. A flat stone near a tree on the left side of the cemetery as you enter the cemetery.